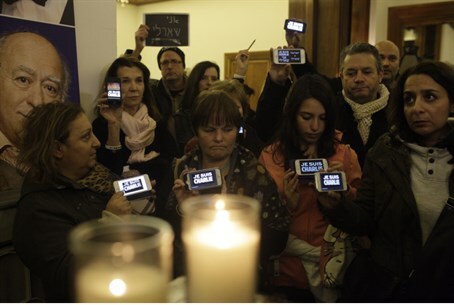 Dozens of French immigrants and public officials gathered in Tel Aviv to show support for the French Jews killed in a terror attack Friday. Dozens gathered at the Mazeh Youth Center in Tel Aviv Saturday night to mourn the four individuals killed Friday in the Jewish supermarket Hypercasher in Paris. Many of the participants were French immigrants to Israel who expressed their grief and disbelief over the tragic attack. "I am really in shock, I can't comprehend it. It's a great disaster. I am so sad. I think that the French Jews need to emigrate to Israel, there's no security there," one participant said. "It's great to see the unity of the Jewish nation," another said. "Our family is in France and it's hard to put in to words our feeling and fears." Other participants described their anger and the need for Jews to get out of France. "I was offended as a Jew, as an Israeli. We hoped things like this wouldn't happen again. Instead of dealing with terror, we're laying our dead to rest. The Jewish victims are part of us, they were killed because they were Jewish. I was offended and upset," one said. "The message to all those in Europe and especially in central France to leave - even if they don't have a Zionist drive, they must leave the area. It's like a ticking bomb. We feel that it's only just the beginning and it can get worse," said another. Public officials and embassy representatives also attended the memorial rally. In a statement, Deputy Religious Affairs Minister Rabbi Eli Ben-Dahan called for Jewish unity and for Jews worldwide to immigrate to Israel. "The people of Israel are one nation, no matter where. We are mourning with the Jews of France for the despicable murder of four Jews and we are praying a full recovery for the wounded." "We are here, the state of Israel, and we need to take care of Jews worldwide and call them to immigrate to Israel; there's no other option. Jews around the world need to understand that the only safe place for them is here in the state of Israel."